2. have 2 very different, but still very good, gig experiences. The crowd is roaring well ahead of the gig and people are already chanting Noel’s name, our 44 years old boy comes punctually on stage at 9pm and the crowd is ecstatic. First song, old time b-side classic “It’s good to be free” is welcomed by a 2000 people chorus that surprises everybody, Noel included. People around us look like they saw the messiah the were waiting since the world’s creation. They sing word by word every single song, old or new, b-sides included. It’s a crowd of “Mad Fer It” Oasis’s fans, craving to see the 2 arrogant brothers to be back on the scene together, in the meanwhile they get settled with Noel HFB and Beady Eye waiting for the big reunion, and they have fun while waiting for it. 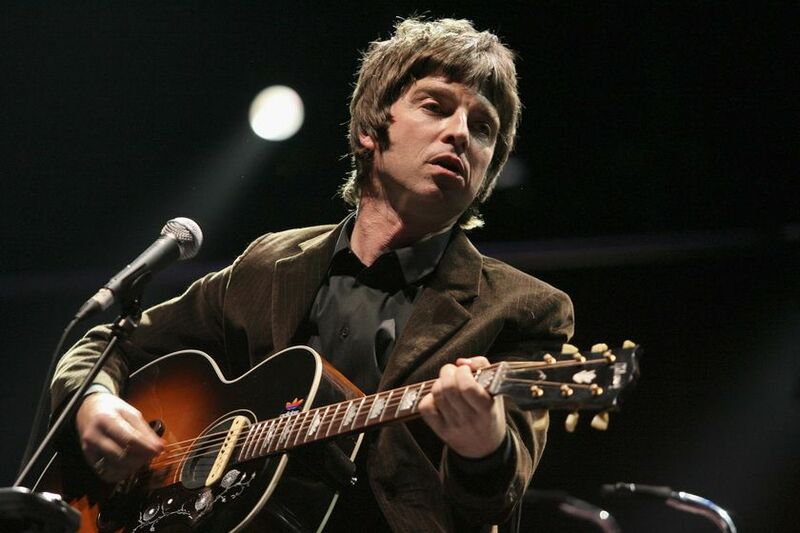 Noel’s set starts with Oasis, then shoots the best pieces form his recent solo album (If i Had a Gun, Dream On, The Death of you and Me) before going back to the old Oasis repertoire. Noel gives away an acoustic version of Supersonic which is simply amazing, followed by Talk Tonight and Half the World Away. The crowd sings and very often starts the songs before Noel and the band (cutting the intro shorter and obliging them to catch up). Noel appears in good shape, so pleased by the crowd passion that a couple of times he leaves the singalong going staring at the fans without singing. He’s more and more in his shoes of front man after 20 years as lead guitarist penning solos next to Liam (crowned recently as best front man of all times), he will never have the stage arrogance that made Liam’s glory but his voice fits really well the whole sets (most of the songs where already played live by Noel when touring with Oasis) and his acoustics interludes are worth the trip. Thanks god we are here for music, Noel knows it and after another trip into the last album (where he could have probably cut at least “The Village Green”) closes with an Oasis only encore. A magnificent version of Little by little, The Importance of Being Idle, Whatever (worth, alone the ticket price) and the anthem of the 90s generation: Don’t look back in anger. In between songs the crowds requests of the Masterplan are turned down by Noel with a great quote: “You want the Masterplan? Do you know Oasis? That was the Masterplan!”, for once a rocker that speaks true! We leave the Teatro Atlantico happy, the Chef has it, he can do it as frontman as well, tonight it was an easy crowd of long time fans, in a rather small venue and he mastered it. Some of the new songs are already among the fans favorites (If i had a gun) and they mix very well with the old ones. Hearing some acoustic version of the old Oasis classics is a no miss for any Gallagher sick out there and is a rare chance to hear some of the best Oasis b-sides that with Liam on scene were more or less forbidden. First of all, amazing venue! I’m not surprised this spot is becoming the center of the Swiss rock music winter scene (off-festival season is probably the only place where you can see some real international indie rock artists). Noel is again very punctual (looks easier without Liam…), the set is exactly the same as 2 days earlier, however, the crowd is very different. Ok, we can’t ask to have the same latin firing passion of Rome in Zurich but probably a middle point between that and the static, voice-less, cold swiss german crowd should exists. Most of the people don’t know the songs by heart (and we wonder what they do here as the ticket costs 65fr…) and Noel takes a bit more time in catching them. It’s probably in Zurich that Noel shows the best potential as frontman by winning little by little the crowd, he talks more than in Rome and he puts here and there a couple of jokes. Strangely (vs. Rome) the songs of the solo album wake up the crowd, with “If I had a gun” coming out as obvious winner. In between 2 songs somebody in the first rows questions Noel about Liam (goes without saying that the ambiance was rather intimate and the crowd much smaller than in Rome…. ), his answer with a big smile was: “Not sure if you noticed he’s not around today, I talk to him from time to time, I talked with him last week, he asked me about you”. In the smaller venue the whole band looks more confident, the HFBs are tailored to fit Noel’s singing, playing and arranging style, great keyboards but vs. Oasis they still miss that wall of sounds that the last 2/3 world tour of his old band had. The final test for the band (and Noel’s) ambitions will be during the festival season in summer and when playing larger venues (O2 Arena, the US late spring). Noel Gallagher, 44 years old, recently started a new career as front man, as we told you above, he’s on the good direction to become a pretty good one, he might never replace Liam to sing the all Oasis songs, but he does a pretty good damn job at singing his owns and for 90 minutes, non stop, sings and plays a 20 years long career built on the hard fact of being a Godlike Genius in writing songs that become great singles and amazing anthems. We saw him twice in 3 days and twice he delivered a great performance ending with the whole crowd on his side. We had 2 very different experiences driven by 2 different crowds but both were musically excellent with an hour and a half filled of Noel’s voice and guitar solos’, and in the end, this is what matter most when going to a gig. It’s all about the music. Highly Recommended: please add a couple of friends from the good old times to fully enjoy it. Special mention to the Folks, they opened both concerts and despite the very low volume managed to play a nice 8 songs set mainly pulled out of their recently published EP, a nice mix of brit rock from the first half of the 90s with the more recent indie rock scene sounds. we will hear about them very soon. Stay tuned.